The alphabet and the universal literacy it enabled was the ultimate disruptive new tech of its age, especially in its environment of hegemonic empires and nomadic oral (illiterate) cultures. Because it was simple and made literacy universal, anyone could broadcast their expressions to a much wider audience. It was like every citizen suddenly got a private printing press, just as anybody in the early years of radio and Internet could create their own channel or webpage and now everyone has a blog. It could represent any language well enough. It was more abstract and enabled new cognitive powers to blossom. It invited self-reflection and self-empowerment and self-affirmation. It enabled the writing of any concept, emotion or abstraction that could be said or thought in words, and therefore opened up the interior lives of people to each other. It created a new kind of intimacy. Think of what the Internet did to the Soviet Union, how much energy totalitarian regimes like North Korea and Iran must put into controlling free expression, and how even an open, democratic society can be shaken by independent operations like Wikileaks, and you get a taste of what the alphabet must have done to Egypt and other sclerotic empires in the region that were attached to the hierarchical control over communication implicit in their hieroglyphics. So it is astounding that no record of the invention of the alphabet can be found in ancient literature, at least so it seems. From this point of view, it would actually be astonishing if the Torah didn’t record the advent of the alphabet. After all, it is the first document of any length to be written in the alphabet and remains to this day the most widely read text. It records the origin of a new tribe or culture, the Jews, and their liberation from slavery to fulfill a new destiny. It reimagines the story of the origin of the world and the human role in it as moral beings. It encodes a new moral order and a new direction for the task of human living. It records the story of the revelation of a new God, Whose new abstract Name is written in that alphabet as Four Letters, the Tetragrammaton. How could it not refer also to the origin of the transcendental technology that made all this possible? Indeed, if we read the original Hebrew afresh and pare away traditional translations of the text, we find the story might be right there in plain sight. According to the Torah, when Moses ascends Mount Sinai the first time, he is living among the Midianites as a shepherd, having fled there after killing an Egyptian taskmaster who was beating a Hebrew slave. Coincidentally, Serabit el-Khadem was in the province of the Midianites in those centuries. Is this just coincidence, or are there other clues that the story of Moses and archeological evidence for the advent of the alphabet are intertwined? It is an otherwise empty grammatical marker of the accusative case (את; EHT – for which there is no translation in English). This least significant word – Ben Gurion, Israel’s first prime minister wanted to eliminate it from modern Hebrew – in some senses carries the most significance and I will explore it further. Moses humbly, or out of fear, protests that for all these metaphysical revelations he is ill-equipped to be a liberator, for he is not good with language. 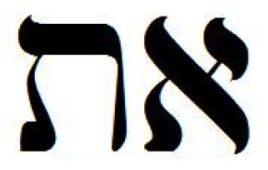 God insists: show these letters to the Israelites, and “If they do not believe in the voice of the first letter (kol ha’oht ha’rishon) they will listen to the voice of the last letter (kol ha’oht ha’acharon).” Further, God promises, “And with these letter (signs) they will worship me on this mountain.” Moses returns to Egypt and does as he has been commanded. He shows the signs to the elders of Israel. In this reading, he has disseminated literacy among the Hebrews. He is now prepared to confront Pharaoh. Aaron and Moses “do the signs” with their rod in Pharaoh’s court. Pharaoh summons his own wizards to show that this upstart technology is nothing special and they can reproduce Moses’ tricks. However, it is clear that this is a battle of writing systems, a contest of two powerful communications techs. Aaron and Moses turn water into blood. Pharaoh’s guys do the same. The Hebrews summon frogs. So do Pharoah’s wizards. The ten plagues can be understood as ten demos of the alphabet’s agility, its power of abstraction. To lend credence to this reading, strikingly, the word that is traditionally translated as “wizard” or “sorcerer” is the Hebrew chartoome’im, which literally means “stone (cheret) engravers.” To this day the Hebrew for “hieroglyphics” is k’tav chartoomeim – writing of the [word formerly translated as] engravers. These wizards aren’t magicians in the sense we are led to imagine them by translations and tradition, in command of magic, they are Pharaoh’s hieroglyphic scribes, in command of the advanced technology of hieroglyphic writing. As Arthur C. Clark famously said, “Any sufficiently advanced technology is indistinguishable from magic.” Of course, the operators of the old priestly writing tech are alleged to be able to work wonders and have mystical abilities. To be a hieroglyphic scribe you must be trained from an early age to become literate in tens of thousands of signs. As keeper of Pharaoh’s most potent weapon, his ability to command and control a nation by owning the means of communication, of course working your devices seems to command magic powers. And of course, as keepers of the channel via which Pharaoh declares himself a god, you are given special status as members of a priestly class.